The permanent establishment (PE) concept is a threshold issue which must be confronted and addressed by virtually every enterprise seeking to conduct trading activities in one or more countries other than its home country. Whether or not an enterprise has a ‘permanent establishment’ in a country defines whether its trading income can be taxed or is exempt under a network of over 1,000 bilateral income tax treaties and some local laws. Today, the interaction of rapidly changing rules, increased enforcement, and evolving business operations creates a challenging environment for tax directors of global businesses who must understand and manage their company’s PE risks. This updated and expanded second edition of a concise guide that has been a key reference for decades – formerly titled Permanent Establishments: A Planning Primer – provides lucid insight into business structuring and the related tax considerations. Completely updated and expanded, it remains the only practical introductory book on PE available. It covers all important aspects of fixed place of business and dependent agency types of permanent establishment, as well as the exceptions for independent agents, permitted ancillary activities, and parent–subsidiary relationships. It provides commentary on applicable rules and discusses regulations and case law from multiple jurisdictions. impact of new developments in mineral extraction, real estate leasing, and construction management. The second edition identifies key PE rulings not only in OECD countries, but also in the emerging BRIC countries. The text integrates conceptual analyses and technical discussion with relevant tax planning considerations, appropriately highlighted or diagrammed. Concisely written, easily readable and topically organized for quick reference, this book will be of interest to all international tax planners, lawyers, accountants, multinational CFOs, executives and others whose role involves the structure and operations of international trading or commercial presence. Chapter 1 Historical Development of the Concept. Chapter 2 Elements of the Basic Definition: Fixed Place of Business. Chapter 3 Building Sites and Construction or Assembly Projects. Chapter 4 Special Provisions for Mineral Extraction. Chapter 5 Agency Permanent Establishments. Chapter 6 Preparatory and Auxiliary Activities and Places. 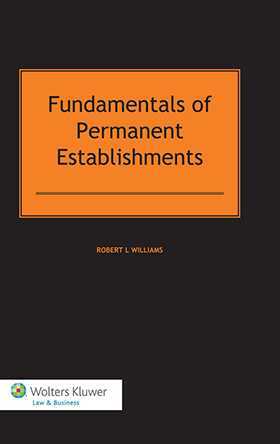 Chapter 7 Permanent Establishments – Services and Secondments. Chapter 8 Tax in the Cloud – The Permanent Establishment Concept and the Digital Economy. Chapter 9 PE Issues Arising from Centralized Tax Models. Chapter 10 Permanent Establishment and Partnerships.